The Player's Companion supplement to the retro-D&D styled ACKS is overflowing with support. One of the coolest part about working in The Escapist office is the passion my colleagues have for all kinds of games. From the frequent Magic matches and tournaments to the on-going Napoleon in Europe board game and lunchtime D&D sessions, there's always something being played at The Escapist. 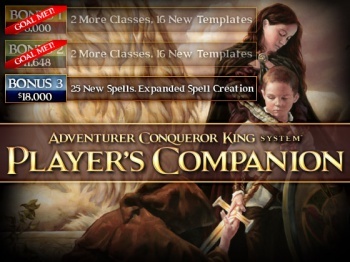 A lot of that passion comes from our publisher Alex Macris, who in addition to running our website has written an entire set of rules for a tabletop roleplaying game called the Adventurer Conqueror King System. Along with contributions from designer/blogger Tavis Allison and yours truly, Macris crafted ACKS to deliver more customization than standard OD&D as well as the evocative high-level domain-level play that was promised in older D&D supplements. An indexed and hyperlinked PDF of ACKS has been selling really well at DriveThruRPG and a hardcover copy of ACKS is coming very soon from Game Salute. But that's not the only product that Autarch has in the pipeline. The Player's Companion offers tons of new classes and templates to play the character you've dreamed about. Classes in the Player's Companion include the dwarven machinist, dwarven spelunker, elven ranger, mystic, priestess, and shaman, and there are rules for quickly generating distinct versions of these classes and the standard classes by rolling 2d6 on each class's template list. Our Kickstarter campaign to help front the costs of producing and publishing the Player's Companion opened the same day as Tim Schafer's Double Fine Adventure. And while we haven't had anywhere near that level of success, the Player's Companion reached the goal of $4,000 in just a few days, and hitting a bonus goal of $6,000 allowed us to include the barbarian and elven enchanter classes. We set a second bonus goal of $11,648 that would break the record of our last Kickstarter effort. I'm happy to say that as of last night we have broken that record and will be able to include the paladin and warlock classes in the Player's Companion, as well as two new races. Because we're excited to have so much support, we've increased our goal again to $18,000. Once our Kickstarter pledge hits that level, we'll include an expanded "Spell Compendium" with 25 custom-designed spells for use with ACKS and guidance on researching new spells within the system in addition to creating new magic items. If you're interested in supporting the ACKS Player Companion, head over to our Kickstarter page and make a pledge. There's ways to get involved at a level that will reward you with a copy of the ACKS core in addition to the Player's Companion, and a whole bunch of awesome rewards like ACKS tee-shirts, illustrations of your character and even a custom-designed character class if you become a Patron Deity. Autarch would love to have your support and you have our heartfelt thanks if you've already pledged.